The Handling Systems International Model 351 heavy duty base mounted jib crane is engineered and designed for floor mounting on a foundation. 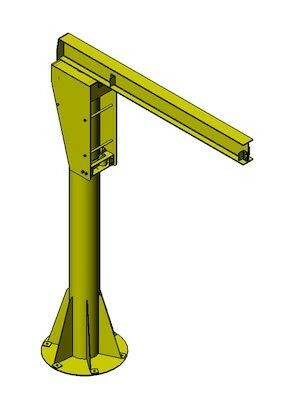 Freestanding 360 degree rotating jib crane. Mounts to floor using Handling Systems anchor bolts and recommended foundation. 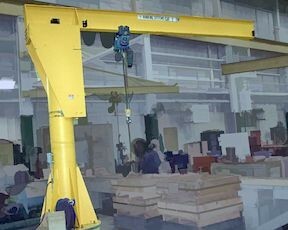 The Model 351 Jib Crane is designed with safety features to prevent removal of head under accidental impact. Boom is an American standard I Beam or wide flange beam, that conforms to AISC and ASTM standards. Girder is equipped with removable end stops for quick trolley installation and maintenance. Bearing housing is rigidly mounted on boom. The mast consists of a heavy pipe design to withstand bending stresses without undue deflection to boom. Assembly is jig welded to insure vertical alignment. Jib crane head is constructed of two heavy sides and reinforcing plates to permit balancing of stress. Lower roller assembly is mounted in a heavy duty machined carriage weldment. Assembly is supported by adjustable tension bolts to permit field adjustment, and to insure even pressure of the rollers on the mast. Roller bearings are furnished in each machined roller and are mounted to the frame through removable steel axles with grease fittings. Top bearing is a tapered roller radial thrust bearing. The HSI Model 351 Freestanding Heavy Duty Jib Crane is base mounted, but is also available foundation mounted and foundation sleeve mounted.